As you all know this month is Breast Cancer Awareness month. Over on Splitcoaststampers they are having their Hope You Can Cling To challenges and all the cards made for the challenges will be sent to the Breast Cancer site in Texas. Since I am now part of the Dirty Dozen (yea…..I’m a ‘Dirty Girl’!) I am participating in the challenges and even hosting on later this month. I made this for the first challenge which was “Show Me What You’re Made Of” where the challenge was to use thing that were your ‘go to’ style. Oh…THAT was easy for me! Base of the card is 4 1/4 x 4 1/4 Very Vanilla and ran through the Stripes embossing folder. 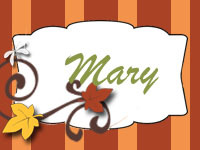 Added a Real Red Banner, then a Marina Mist Polka Dotted Banner with a Crumb Cake Large Scallop edge under it. I stamped the image using StazOn Jet Black ink on Watercolor paper, colored with markers (Marina Mist, Crumb Cake, Soft Suede), pierced a heart around it (another ‘go to’ thing for me) then added that little red heart from the 2-step Owl Punch. This was added to the card front using dimensionals to finish it off. I was asked to host a “Hope You Can Cling To” challenge on Splitcoaststampers and I would love if you would join me. You can find the information about my challenge HERE. For my challenge I decided to honor a friend of mine (and former downline) who lost her battle with cancer in August. Although hers was not breast cancer, it was still extremely devastating. Robin was the Post Mistress of a small post office close to my house. I always went there to do all my swap mailings, we became friends then she joined my downline. She was one of the nicest people you would ever meet. She died at the age of 46. So in honor of Robin, my challenge on SCS is “Let’s Lick This Thing”…using postage stamps, postage stamp punch on your cards. For my second card I stepped things up just a bit. I do LOVE this little flower image so decided to use it again. 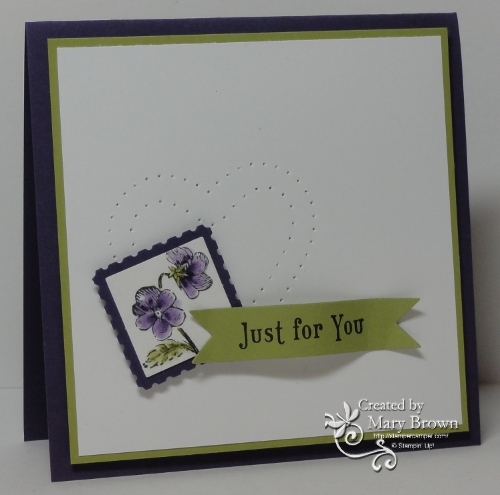 The base of the card is Wisteria Wonder. I took another piece of Wisteria Wonder and ran the bottom through the Delicate Designs embossing folder, layered on Whisper White, stamped Green in StazOn Jet Black, made a ‘bow’ (click on tutorial tab above to access my bow tutorial) using Lucky Limeade Ruffled Ribbon and a purple rhinestone brad (retired), added an extra piece of ribbon then wrapped around pane then added to the card base. 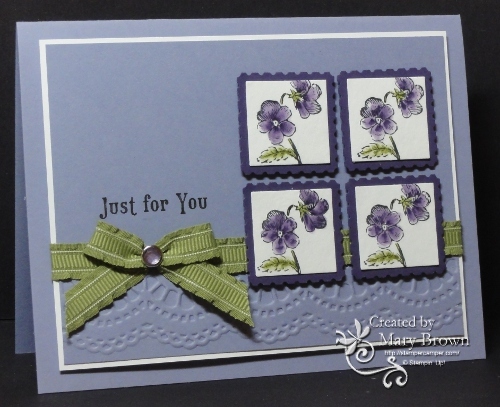 I stamped the flower 4 times using StazOn Jet Black on Watercolor, colored with Elegant Eggplant and Lucky Limeade, punched with the 1″ Square Punch then layered onto Elegant Eggplant Postage Stamps. These are added to the card front using dimensionals. For my first card I decided to go very CAS. The base of the card is Elegant Eggplant. I took a piece of Whisper White and pierced a double heart on it, layered it onto a piece of Lucky Limeade then to my card front. I stamped the pretty flower image using StazOn Jet Black on Watercolor paper, colored with Elegant Eggplant and Lucky Limeade markers, punched out with the 1” Square Punch, layered on an Elegant Eggplant Postage stamp punch then to the card front using dimensionals. I stamped the greeting using StazOn Jet Black on Lucky Limeade, cut with the Bitty Banner Framelit then added to the card front using dimensionals. So please, if you have time, join my challenge. Once you make card you then donate that card to a Breast Cancer site in Texas to brighten the day of a person fighting Breast Cancer. “Let’s Lick This Thing”!